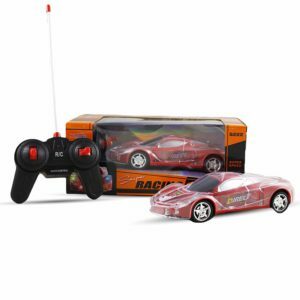 Haktoys Light Up Racing Red 1:24 Scale RC Sports Car with Spectacular Flashing LED Lights | Radio Control Vehicle with Flexible Antenna | Safe and Durable | Gift, Toy for Kids, Boys and Girls is now available at Amazon.com for just $14.95 (REG $29.99) (As of 21 January 2019, 22:04 PST – Details) with $15.04(50%) Savings. Super Fun Light-Up R/C Racing Car for Toddlers and Children! LED Lights all around the body. Fully functional forward, backward, left, right controls. Made of high-quality, non-toxic materials. ASTM-certified, safe and durable. Measures 7.9 x 3.2 x 2 inches. Recommended for flat surfaces, low-carpet or tile floors. 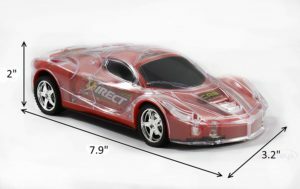 Control distance: up to 50 feet. Requires 5 x 1.5V “AA” size batteries (Not included). Comes in Red color and 40MHz frequency. 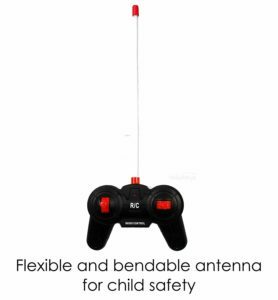 Comes with a bendy antenna for added child safety. Note: Transmitter may interfere other 40MHz RC toys nearby. Note: Do not forget to install the antenna – it is located on the far right corner of inner packaging. 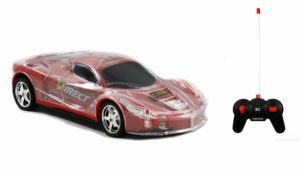 Have a blast with the new super-fun, ultra-cool sports LED Light Up RC car! 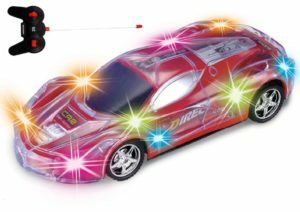 Featuring long-lasting LED lights, this radio control car is so much fun to drive. Surprise someone special with this fun gift! Helps younger children develop cognitive skills and create imaginary scenarios for play. 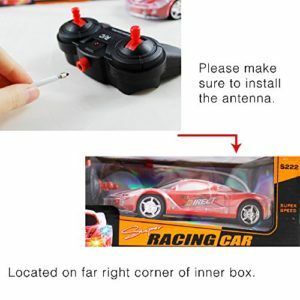 Do NOT forget to install the antenna – it is located on the far right corner of inner packaging. The controller is suggested to be pointing toward the car so that the antenna can send/receive signals better. If the car does not drive straight, please check underneath the car for adjustment switch. Recommended for flat surfaces, low-carpet or tile floors. Instructions are located on bottom of the box. Use of good-quality brand-new batteries is recommended for good performance. Make sure to follow safety precautions in the product manual and on the product packaging. Since this product has 40 MHz frequency, transmitter may interfere other 40 MHz RC toys nearby.